Are you looking to buy your first overhead crane system and need to know where to begin? Or, maybe you're looking to add another crane or replace an existing crane so that you can expand your production capabilities? Overhead cranes can vary so much in terms of specifications and configurations—no two crane builds are exactly alike! We truly believe that the more informed you are during the purchasing process, the better you'll understand how to design and specify the right overhead crane for your business and get the best bang for your buck. Our goal for this E-Book is to provide you with the information you need to select the right type of overhead crane for your business' needs. 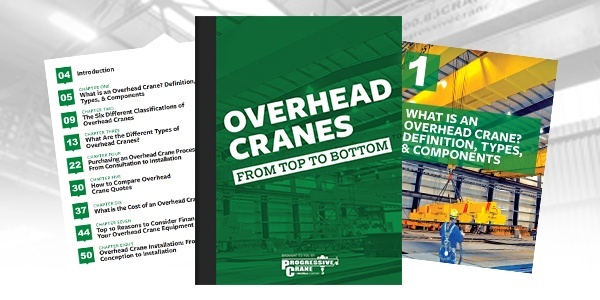 Please fill out the form on the right-hand side of this page to receive your FREE copy of Overhead Cranes: From Top to Bottom.